Let's get this out of the way up front: Mass Effect 3's latest—and last—downloadable add-on, titled Citadel, is terrific. In fact, if you're a fan of the Mass Effect series, particularly one who's been there from the start, it was more or less made for you. Citadel is fan-service of the highest order. That term can often be made to feel like a pejorative, but in this case, it's purer than that. At every turn Citadel displays an irresistible fondness for the series' history. It's an adventure written and designed with nothing but love for Mass Effect, an often goofy, ultimately touching farewell to the world and the characters that we've followed for the last six years. I'm going to have to keep this write-up pretty short and light on spoilers, because much of what made Citadel work so well was that I had absolutely no idea what to expect going in. I previewed a bit of the Leviathan DLC but never finished it, and I skipped the Omega add-on. I hadn't even watched a trailer for Citadel. In fact, for a little while yesterday, I couldn't even remember how to activate the new content. 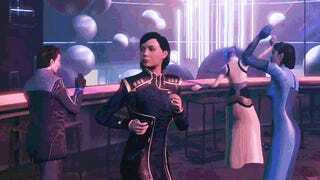 At the outset, Admiral Hackett contacts Shepard and instructs her to take some shore leave back at the Citadel, allowing her to stay in Admiral Anderson's swanky, massive apartment. In fact, Anderson more or less bequeaths the apartment to her, giving players a pretty sweet pad on the Citadel that they can upgrade and customize. Shortly after Shepard arrives, Joker calls her down to meet at a posh Citadel sushi place, and things go haywire in a hurry. As usual. WHY: This one's for the fans. Citadel is a warm-hearted tribute to the fantastical world we've spent the last six years exploring and the characters we've met along the way. Type of game: Story-based downloadable add-on focusing on action, apartment upkeep, and even some stealth. What I played: Completed the main adventure in 2 to 3 hours, hung around for another hour doing minigames, combat challenges, and meeting with my old friends. The in-jokes are great, and demonstrate an understanding of all the silly gags, idiosyncrasies and memes that the Mass Effect universe has generated over the years. In the end, it's all unexpectedly poignant. I was surprised to find that despite (or even because of) all the laughs, Citadel left me feeling bittersweet. Combat isn't ever all that fun, and a late-game battle doesn't flatter Mass Effect's somewhat crusty third-person combat. The animations on the new character Brooks are wooden enough to make me laugh at the notion that we ever thought Mass Effect games had convincing digital actors. "This DLC has done the impossible: It's made me like James Vega." "Somewhere out there, my Commander Shepard is still dancing." Before long, Shepard and her team are swept up on a fast-paced adventure through the Citadel, which ends up involving a casino heist (!! ), plenty of difficult shootouts, and more story surprises than you can shake a stick at. The whole thing feels something like a one-off episode of Star Trek, with a self-contained villain, a bunch of wacky hijinks, and all the banter you can handle. Perhaps a bit more specifically, it plays out like the 18th episode in the old 22-episode season length, the breath of air before the plunge into the dramatic season (or in this case, series) finale. The story certainly doesn't feel connected to the plot of Mass Effect 3, but that's almost surely intentional. 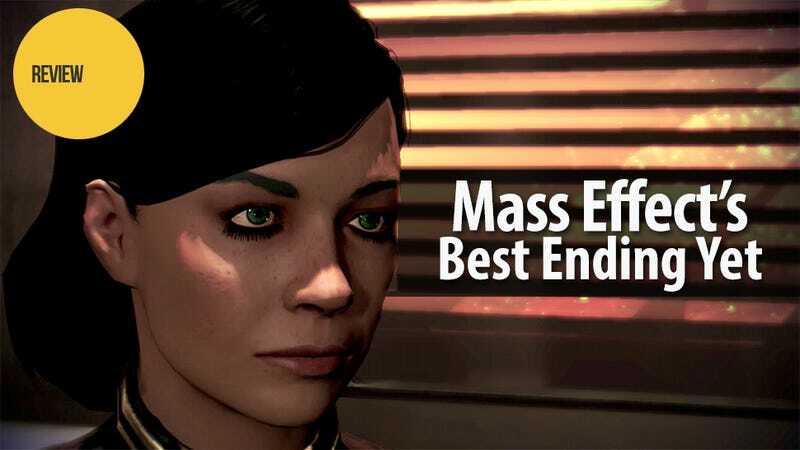 After all, it's been almost exactly a year since many of us embarked on the epic (and somewhat controversial) grand finale of the Mass Effect saga. Here we are a year later, so it's okay that the story of Citadel, ostensibly set during a forced "shore leave" period while the Normandy is undergoing repairs, feels less like canon and more like a dream-episode or a Christmas Special. Given how awkward it would have been to try to get players re-invested in the story of Shepard, the Reapers, and the end of all life in the galaxy, BioWare made the right call. Eventually the whole squad is reunited, quipping and wreaking havoc without missing a step. While Shepard is still fighting alongside the requisite two companions, the rest are up in the wings, visible but not directly engaged in fighting, hopping onto the radio and cracking jokes along with everyone else. Some of the best exchanges are written for the entire crew, so the writers were free to write a single joke, rather than having to write it multiple times for various possible squads. That makes the jokes feel bigger and more ensemble-oriented, and also a heck of a lot more fun. For example: The players who aren't in Shepard's squad form two groups: "Team Mako" and "Team Hammerhead." They immediately begin a playful competition to see who can take out more bad guys. "We all know the Hammerhead's better than the Mako," says a member of the crew, in one of many meta-jokes that are just cute enough to work. The main adventure took me around two to three hours to finish, but Citadel actually continues for a while after the battle's won. It contains a lengthy denouement that has players exploring a festive new chunk of the Citadel seemingly untouched by the refugee crisis and war outside, drenched in neon and filled with minigames and diversions. (Again: The disconnect is for the best.) You can hang out with every member of your crew and share lovely little character moments, or you can go gamble, or engage in a very involved combat simulation tournament that's even got its own built-in economy. There's plenty more: Every scene is stuffed with in-jokes and references, a bit in the Citadel archives allows you to relive various key moments in Mass Effect lore, and there's some great overheard enemy dialogue, if you take the time to listen. Some of the social sequences towards the end seem like they could play out dozens of different ways, given the fact that they involve each player's specific cast of surviving characters. I play as a female Commander Shepard, and the wonderful actor Jennifer Hale brought her A-game to Citadel. Shepard's last hurrah is a rangey, well-written part that's as surprising as it is warm and genuinely funny. Hale must have had a lot of fun bringing her character across the finish line. And okay, sure, I could see people grumbling that it's all just too much—the wackiness may be over the top for some, and others may find the more blatant fan-service to be cloying or annoying. If we're bloodlessly analyzing the pacing and design, it's all a bit of a mess, and the whole thing doesn't remotely jibe with the elegiac energy that Mass Effect 3 often conjured so effectively. If you're just a casual fan, or came to the series at the second game and never got all that into the details or lore, this might not be your thing. And the combat can be a real nuisance, particularly the climactic encounter, which takes place in an oddly laid-out room that doesn't feel built for combat and highlights the weaknesses of Mass Effect's aging combat system. But when all's said and done, Citadel is a winner. It's a loving tribute to Mass Effect fans everywhere—fans who, it must be said, can't have always all been that easy to love, even when their gripes were legitimate. BioWare didn't have to go all-out; they could have given us another adventure along the lines of Leviathan or Omega, or even the fantastic Lair of the Shadow Broker. Surely they're ready to move on to new things, to more-exciting, fresher projects. But these people seem to have had some things left that they wanted to say, and damn it all, they weren't leaving until they said 'em. Citadel has the nostalgic enthusiasm of an action-movie reunion, a team of old heroes putting the gang back together for one final caper. It's a fine reminder of just how much care, talent and love went into building the world of Mass Effect in the first place. While debates over the actual ending of Mass Effect 3 will never truly be resolved, it's nice that the trilogy could go out on such a light-hearted, affectionate note. This is the sendoff Commander Shepard deserves.